Hague Fasteners have been manufacturing High Voltage Insulated Bolts for decades servicing the turbine and power generation maintainers and manufacturers. Hague’s highest quality British manufactured Turbine Studs and Hex Bolts are wrapped with Epoxy Glass which is then finish machined to make the Insulated Fastener that can then be safely installed within the high voltage generator. The bolts pictured are smaller items used in an 11.5kV generator with rotor expiration voltage of 500V. 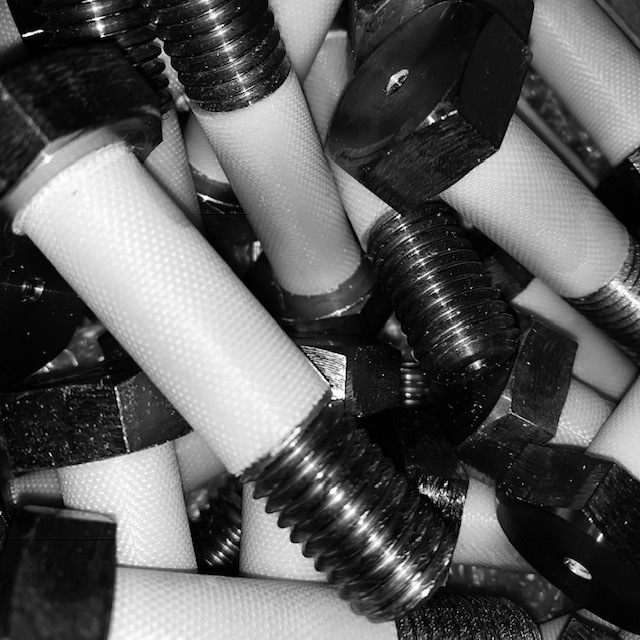 Insulating sleeves and washers made in flame retardant epoxy glass are often manufactured to suit the special insulated bolt manufactured typically to OEM designs and drawings.